milners curiosity or not ? Thread: milners curiosity or not ? I remember hearing a story, about wood in Milner door pans, many years ago. 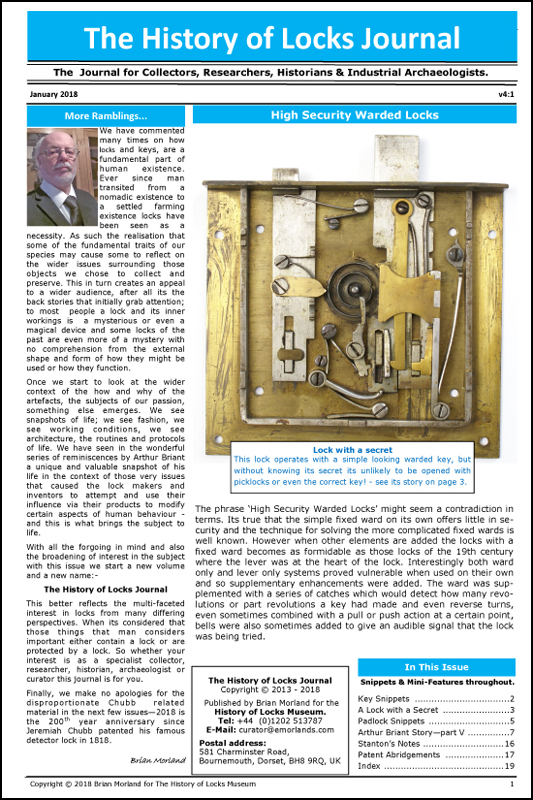 Apparently, one method of opening some of their earlier safes, was to locate the six lock fixing bolts, where they come through to the outer surface of the door, and to knock them out with a hammer and punch, so the lock falls to the bottom of the door pan. Sounds like a long and noisy process, but possible. Maybe a drill would have been better, assuming they weren't hardened. The closely fitting wood keeps the lock roughly in place, so the door bolts can't be withdrawn. Some angle iron around the lock, fixed to the door pan, would have achieved the same result, so I don't know if the story is true. Yes Magpie, the story is more or less true. In earlier times safe mechanics as they were then called, carried templates of Milner and Ratner locks which enabled them to locate each of the six fixing bolts with reference from the keyhole. Punching out without pre-drilling sounds unrealistic. Having centre-punched each position it usually revealed the end of the blind hole into which the bolt was fixed and which was then drilled with a 5/16th to a depth which cleared the door plate and the hard plate. It was then simple to punch out each bolt. The Milner safes with wooden inserts were only produced for a short time from 1854 as they were seriously criticised by rival Geo.Price as being more susceptible to gunpowder attack where the charge would be more confined within the wood. Incidentally the lock which Milner was using at this early stage was the Hobbs made gunpowder-proof Milner Patent also of 1854 with different profile and most unusually locked up. So, while the wooden inserts would have prevented the Hobbs lock from disengagement, this would only have applied for a very short period. Lastly, at that time the six holes would have had to be drilled by belly-brace and hand hardened spade drills. From personal experience I know how difficult this can be when there is no power on the premises even when using modern twist drills but with a hand-drill. P.S. In later years Milner bolted a pressed steel shroud on top of their locks in their List 3 qualities to over come this weakness. Very frustrating if you've already drilled off the lock. Perhaps Tom might have a point when he suggests the possibility of the wooden blocks being a later addition? Looking at Stephane's photo and in particular at the wood in the lower half, focus directly below where the tail-bar slides on the guide and bracket (the wood has been cut to fit under it). I would expect to see a lot of staining there from 150+ years of rust and fine powder falling down from the abrasive action above. Instead, it looks one of the cleanest areas of wood in the entire door ! Safeman, my post didnt question the purpose of the wooden blocks in the door, but whether the blocks in Stephane's example are Milners' originals or were perhaps added at a later date. bonsoir guys, the 2 pieces of wood has been cut with an angle recently. the inside panel as been removed by past so probably the wood has been cut at this moment, the cut is very fine and i can explain why. i think the pieces are from origin because the wood seem old, some old design nails link the different pieces. the inside of the panel is very clean, not something air proof but very confined although he was open. and about the advertisement glued on the inside door panel.... an idea ? this is something to keep in this condition ? Stephane, this safe looks like a Milner List 3 made approximately in 1854/5. The advert shows Milner's display of safes at the Great Exhibition of 1851 in the Crystal Palace London. Also shown are the lockings available - Milner's 6 lever detector lock or the Hobbs Protector at 10/- extra. In 1854 Milner Patented his Gunpowder-Proof keylock which he had made to his design by Hobbs & Co, newly formed just after the Exhibition. Coinciding with this Patent he included the filling of the free space in the fire chamber with a wood filling, the purpose of which was to prevent large quantities of gunpowder from being poured inside through a hole drilled in the door plate. This 'improvement' was criticised by his main competitor George Price as promoting the effectiveness of such charges and the filling was discontinued shortly afterwards. So Stephane, this safe is quite rare. thanks men for all details. very interesting. i am fascinated by these story and technique to open this kind of old safe by outside. for this one i broken my impact driver and this is not a cheap one ! so i don't promote the safe cracking but i am "admiring" when i compare some difficult i have with a full access ! just incredible. I wish I had a pound for every tool I have broken on safes! An acquaintance of mine was a school teacher and, frankly, a prat. He had a safe where something wasn't quite aligned properly and it was awkward to get the key in and out. I offered to sort it for him, but he decided to enlarge the keyway by drilling it, including through the hardened plate. So he hit it with his black & decker at about 1,800 RPM. It was amazing to see the chips and swarf coming out. Needless to say the keyway was the same size and he had destroyed his bit. Of course being a teacher he wasn't wrong.